Navigation »Cigarette Forum & Smokers Community > Smokers Forum > Smokers Rights » U.K. smoke-free by 2030!? PHE warn though that attempting to quit by simply going cold turkey is not an effective method when trying to kick the habit. Will-power alone isn’t enough. I try to kick the habit of not smoking enough. Cold turkey simply doesn’t cut it, I need visual cues and tobacco ready to hand. Willpower is fine to a point, but it takes effort to beat one pack a day and beyond. Last edited by Reynard; 09-28-2018 at 04:13 PM. The anti smoking lobby is always trying to stand between us and cigarettes. 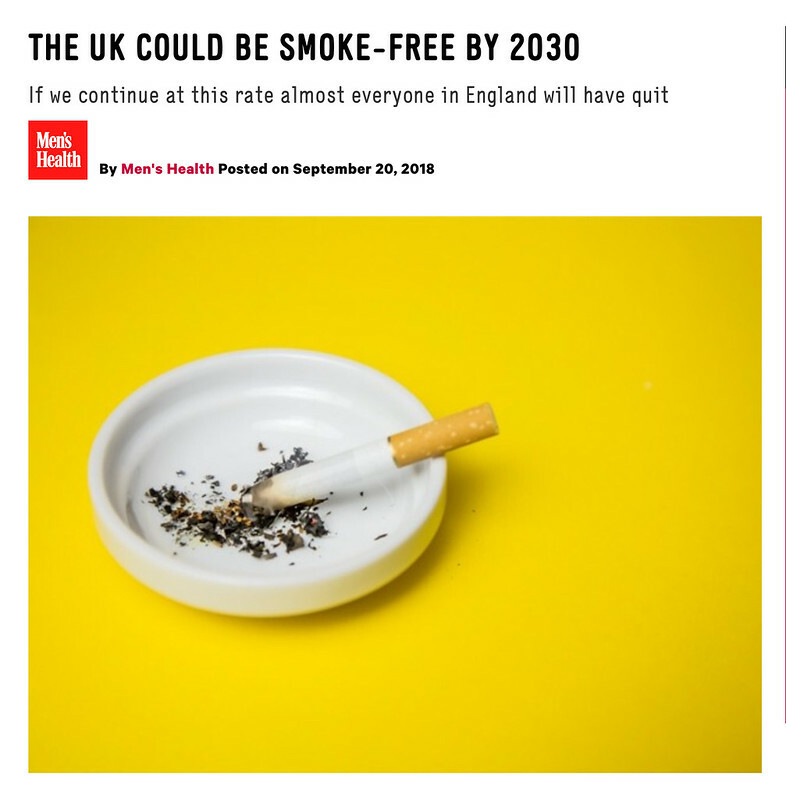 I don't know all the rules and law of England, but, before this were to ever happen, they will have to consider all the lost tax dollars and the numerous job that would be impacted by eliminating cigs. I might not be old enough and have the experience of longer term smokers and the economy, BUT, I don't think this is going to happen anywhere without taking a LONG TERM look at what would happen if this took place - lost jobs, lost tax dollars vs eliminating smoking. As long as governments need tax revenue there will always be tobacco companies and there will always be smokers. Statistically, smokers in the U.K. pay for the care they receive via our national health service through the heavy taxation of cigarettes and tobacco, including if needed end of life care, 3 times over. The government need the money they rinse from smokers to prop up our health service. We have fewer smokers here now, but our taxes are rising. In my opinion getting to this “non-smoking” 5% would be a financial catastrophe for the government. So much hypocritical horseshit though. We have standardised packaging here, which as I’m sure you know means 100% of our packs are covered in propaganda. But they don’t begrudge propping up public health with our money. According to the WHO, the smoking prevalence rates for the United Kingdom are 34.7% for adult men and 31.1% for adult women ("adult" means age 15 and up). These are fairly recent figures (edit: well, as it turns out, not quite as recent as I thought, but I doubt the difference from when the WHO Report was done to now is as dramatic as what domestic figures would have you believe). And this "Men's Health" article thinks it's going to be 5% in eleven years? They must be smoking something, and it's not tobacco. Last edited by masklofumanto; 01-03-2019 at 07:44 PM. ...this "Men's Health" article thinks it's going to be 5% in eleven years? They must be smoking something, and it's not tobacco. Nothing sufficiently CBD-rich either, that’s for sure. Last edited by Reynard; 01-03-2019 at 07:11 PM. I copied the statistics a year or two ago into MS Word, but I'll try to find the original URL. Taking into account 15-17 yr. olds might have some impact, but i don't think that explains the discrepancy between the WHO figures and the government's. I think government statistics tend to be "massaged", and not just the U.K.'s. Edit: I found it -- but the report isn't as recent as I had thought. It's 10 years old. I think there would have been some decline, but not as much as what most governments report. For example, taking the chart you posted as an example, there would have had to have been a drop of almost 10 points just between the WHO report in 2008 and your chart's showing for 2011. A drop by nearly 1/3 in 3 years -- really??? This thread reminds me, by the way, that some time ago (in think in 2010) the New Zealand government set a goal of being 100% tobacco free by 2020. That's now just a year away -- now how is that going? Last edited by masklofumanto; 01-03-2019 at 07:48 PM. Yes that does seem a drastic drop in 3 years lol. I don’t trust 99% of statistics , interests are always cherrypicking data for their own means. It’s like a form of tyranny of the people who control and manufacture our consent, without getting too political. 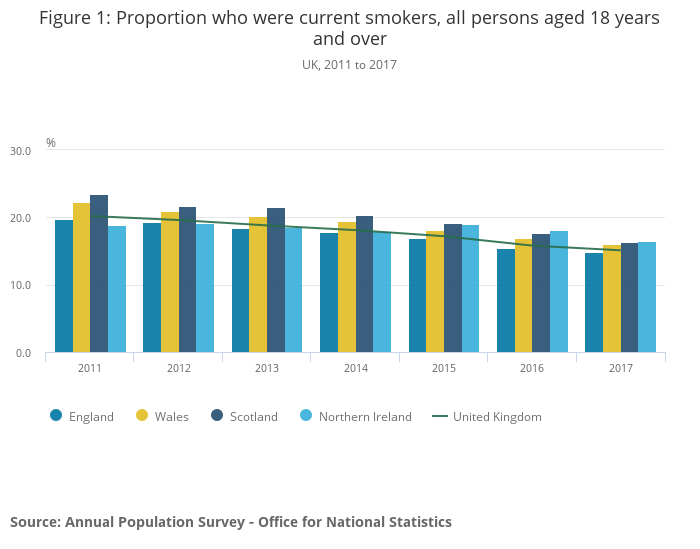 I gather that here in the UK the reduction of smoking has been concurrent with a massive rise in the use of e-cigs, especially amongst millennials. Also cannabis is proving very popular with this demographic. But tobacco not seemingly so. The youth is still the most popular age-bracket though, that’s the funny thing about stats.